Is demand for aws skills skyrocketing? 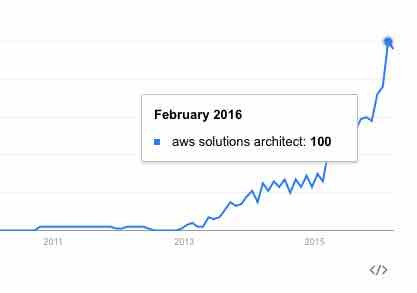 If Google trends is any indication, we’re heading for a serious skills shortage around AWS. If you’re a devops, sysop or systems administrator… don’t walk, run in this direction! I’ve pivoted a few times in my career, and knowing which way the wind blows is how I keep up with change. And right now it seems to be blowing into the cloud! I’ve been hearing from more & more recruiters recently. And all they can talk about is redshift & AWS cloud solutions architects. I think recruiters sit in a unique position & have the pulse of the market like nobody else does. AWS is pushing hard to help sysops level up their skills. This can only help push adoption, but it’s also ideal for those who are ready to learn more about the cloud. Next PostNext Does Amazon eat it’s own dog food (ahem…) or drink it’s own champagne?